I love Thai curries. Spicy, fragrant, yum. Unfortunately, curries are always without a doubt high-fodmap and a no-go for us fructose malabsorbers. It mightn’t be obvious by looking at the dish itself, but hidden in the curry paste there’ll be the ‘fundamental’ additions of onion and garlic. When diagnosed with fructose malabsorption I was convinced I’d never be able to indulge in a curry again. Turns out, like most things, onion and garlic are definitely not fundamental to a perfectly satisfying curry. Thank goodness!I’m often asked what the most challenging thing about my diet is. Without a moment’s hesitation, I’m ranting about onion and garlic! Removing wheat has been pretty straight forward with the many substitutes and gluten free alternatives (especially in the lovely Melbourne). Removing lactose, likewise, has been pretty easy as there are so many alternatives and low-lactose dairy products. But removing damn onion and garlic is always the biggest challenge. It seems to creep into everything. Seriously, I can’t even tell you the amount of products and dishes that contain these two simple ingredients. Sauces, flavourings, marinades, dips, powders, you name it and it’s probably got some form of something oniony or garlicy in it.Previously, I cooked with heaps of both onion and garlic, and ditching them meant filling the void with something… anything! It took me awhile to get my head around the whole concept (like how to eat a steak sandwich without caramelised onion?) Well it’s not that hard, and it’s been all positive. I have since introduced SO many new and different flavours and ingredients into my cooking. I actually don’t miss onion or garlic at all – yep, this coming from a former roasted-garlic-smeared-on-bread kind of girl. I feel great and eat way more exciting foods. What more could I want!? So even though being strict with onion or garlic is a hard feat, it does get easier, I promise. Yes, eating out can be a nightmare, and to be honest sometimes quite nerve-wracking, but it can also be an amazing experience. When you receive food that someone else has prepared that you can actually eat, you are that much more appreciative. 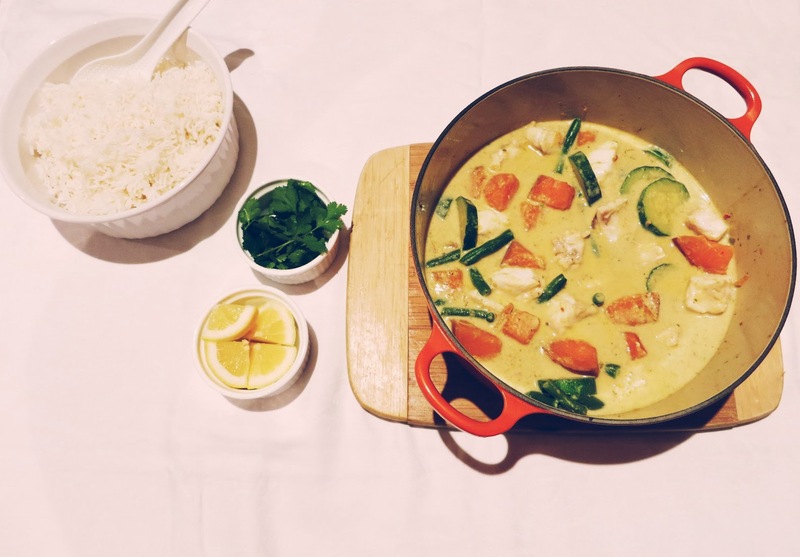 Having said that…….. you won’t find a fodmap-friendly curry. Sorry if I got your hopes up there! But don’t fret – I’m about to share with you one of my favourite curry recipes to make up for it. To me a curry has to have warmth, fragrance and a super special kick. This curry I’m sharing with you ticks all the boxes. The truth is, this recipe is similar to other curry paste recipes, just omits onion and garlic. You would think this would change everything. It doesn’t. The flavours of ginger, lemongrass and chilli are as prominent as ever in this dish, and just shows you how delicious life still is. The paste can be frozen in ¼ cup serves and used for a couple of meals – bonus! To make the paste: Soak dry red chillies in boiling water, cover for 15 minutes. Dry fry spices til fragrant, and place in food processor. Place all other ingredients in food processor, along with the drained chillies. Blend til a paste has formed. Store in a jar in the fridge for up to a week or freeze in ¼ cup serves. To make the curry: Prepare ingredients and place rice on to cook. Chop vegetables and fish into evenly sized pieces, toast peanuts in a fry pan, and set aside. Heat a drizzle of oil in a heavy saucepan on medium-high heat. Fry curry paste for a minute, until fragrant. Add coconut milk, fish sauce and kaffir leaves, and bring to the boil. Add sweet potato and reduce to simmer for 10 minutes. Add zucchini and beans, simmering for another 10 minutes. Add fish, and continue simmering until fish is cooked, 5-10 minutes. Serve with rice, toasted peanuts and fresh coriander. Thank you for this recipe – I love it. I made it as a chicken curry and it was delicious. My other half declared it a winner. I also added 1 tbs of oil to the paste which gave it a more “pasty” consistency. Thanks Pauline! You’re very welcome. I’m glad to hear you and your other half enjoyed the curry so much. I sometimes have to tweak the recipe a little bit too so that’s great you managed to get a nice pasty consistency! Jacqui, thank you so much for your comment! It is very well-timed as I’m actually making a double batch tonight myself. I’ll be using a serve for tonight’s dinner, freezing a couple, and ‘gifting’ the rest to my expecting brother and sister-in-law for their freezer, as I think they’ll be a little busy next week! I made this curry paste a month or so ago and had half fresh and froze the other, to pull it out for a scratch meal early this week – both versions were delicious – it got the big thumbs up at home and tasted much better than jars I've had in the past. I used fresh chilies from a friend's garden (they were small quite hot ones, so the main issue with using fresh is what type and how hot, but you could easily play it safe and leave out the chilies in the paste and add them to taste in the curry proper). When I bought the shrimp paste from an asian food store, the guy who served me stopped me from buying the brand I had picked up first, saying it was designed for chinese cooking and that it wouldn't taste right in a thai-style dish. The one I bought definitely tasted right. I just used my own judgement for the fish/vege component – probably used more (but a different combo) of veges and a smaller amount of fish and prawns (but did braise some eggplant in garlic oil which is is low fodmap) – and rather than coconut milk used an onion/garlic-free stock cube and water with a bit of coconut milk powder. Less rich (and less fat for my partner's heart friendly diet), but packed with flavour. I'm going to make a bigger batch of paste next time. I'm sorry to hear it didn't work out for you. It is rather a big batch serving 4-6, and I do love my veggies so that'll explain the green bean portion! So. I made this for dinner tonight, and I really wish I'd made a half recipe because mine turned out pretty eeeh. I went into this without knowing that US and Aussie measurements are different, for starters, so that is probably the first place I went wrong. I also probably should have used a smaller sweet potato. I only used 50g green beans, but I think if I made it again I would use half as many as I did. You can use dried kaffir leaves to sit in the curry when simmering for flavour but not in the curry paste because they're not too nice to eat! With the chillies, I haven't tried this particular recipe with fresh chillies but many curry pastes do use them so they would be fine. The consistency would just be different.